Connect your family…with Google calendar, or family organizing apps like Hub Family Organizer or Cozi to help keep everyone on schedule and in-the-know of who’s where when. LOVE…using a family collage frame for a visual reminder of everyone’s schedule. Each photo in the collage frame can be a day of the week or a family member. Then use a dry erase marker to update the scheduling information. See picture below. Carry your shopping plan…to shop for school supplies as you go. This time of year, it seems you can buy school supplies just about everywhere you shop; no need to take special trips to crowded office supply stores. Find deals at drug stores and grocery stores as they put school items on sale to clear their shelves for seasonal items. Stock up on those items you know you’ll need mid-year; office supplies are cheapest this time of year. Designate the Family Command Center. Declare a space for all papers that need reviewing or signing. They get set and picked up here, not buried on the kitchen counter under the newspapers. LOVE…having a decorative rectangular basket for each member of the family, labeled with their name, all in a row at our front entrance – easy to drop in what needs doing. Mom needs to sign the field trip form? It goes in her basket. When Mom signs it, it goes in Junior’s box so he can return it to school. Need a patch sewn on that Girl Scout sash? It goes in the basket so Mom (or Dad!) can do the job. Prep the night before…to ease the morning rush. Pack lunches and backpacks. Lay out clothes. Set socks and shoes by the front door for running out to meet the bus. Go ahead, sleep in a few extra minutes because you’ve prepped! Plan your meals…for the week. Put your menu together, do the shopping and as much prep as possible, so the weeknights aren’t stretched thin with having to cook…or sit in a drive-through line. LOVE…roasting a chicken on Sundays for a couple of easy meals during the week. And hard boiled eggs ready in the refrigerator make for a quick breakfast or snack. Just don’t give them to the kids for the bus or in their lunch; it won’t make them popular! Set up a snack bowl…with heathier grab-and-go snacks. Bags of nuts. Whole fruit. Grape tomatoes. Baggies of cut vegetables or popcorn. Protein bars with low sugar. Running in, running out, the snack basket is a hunger crusher. Stash some gifts…for the birthday parties you just heard about or the goodie item Little Debbie needs to bring to gymnastics this week. Pick up a few universally-well-received birthday gifts or treats for keeping on hand to avoid running out to the store at the last minute. Always stock a few general sentiment cards, gift bags or wrap. Find YOUR zen. Plan time on your schedule to exercise. Meet a friend for lunch. Sit with a cup of tea for a few minutes when you arrive at work. What helps you be at your best? Do it! 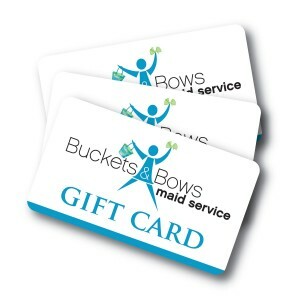 LOVE…hiring a cleaning service, like Buckets & Bows Maid Service. Celebrate back to school with a weekend free from house cleaning and give yourself the gift of time…to plan, prep and play. It’ll start off the new week right, too!